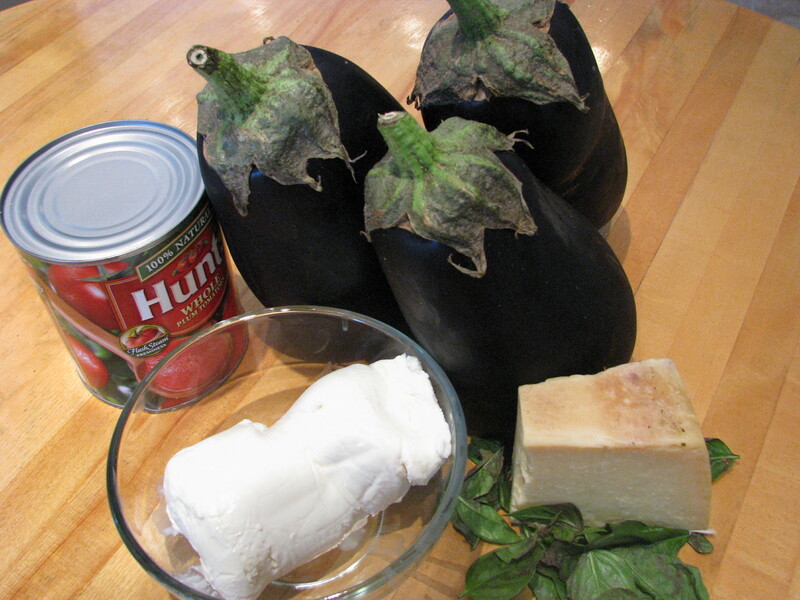 Posted by Bravado Cooking for Men in Classic Italian Dishes, Classic Vegetable Dishes, Recipes. Eggplant has been around for a long, long time. It originated in India maybe 3,000 years ago. The three largest producers are China, India and Egypt, who produce twenty times more than anyone else. Few of you have heard of the names of eggplant dishes in those countries, but as we get closer to home, you will all recognize Greek moussaka, French ratatouille, and the most famous of all, Italian Eggplant Parmesan. Some people say that if God had a favorite dish, it would most certainly be Eggplant Parmesan. I grew my own eggplant last year and started reminding friends in midsummer that they would soon be ripe and we would prepare this great dish together. Anticipation works in many sports, and cooking is one of them. Soon I had people begging to be invited. I have tried to get this same anticipation thing going in my romantic activities, but she is still not begging the way she should. Ah, but I digress, again. So, why has eggplant been used for over 3,000 years and in countries like China, India, and Egypt? The answer is that these societies have high population density and problems related to food storage and hygiene. They choose foods that have protective phytonutrients that kill bacteria and scavenge the human system for “bad guys”. Eggplant has a number of such phytonutrients including chlorogenic acid. “Benefits attributed to chlorogenic acid include antimutagenic (anti-cancer), antimicrobial, anti-LDL (bad cholesterol) and antiviral activities.” (whfoods.com). Many of the phytonutrients are in the skin, so better to not peel your eggplant. Phytonutrients are a popular topic in nutrition today. The word basically refers to substances found in plants that can be assimilated by the human body and provide benefits especially in the regulation of bodily function and protection against bacteria and disease. Phytonutrients exclude vitamins, fats, carbohydrates and proteins – the things on which we usually focus. The best example of the power of phytonutrients is cilantro, used by Mexicans cooks in almost everything they make, and for a very simple reason. Cilantro has a phytonutrient called dodecenal, “which laboratory tests showed is twice as effective as the commonly used antibiotic drug gentamicin at killing Salmonella” (whfoods.com). 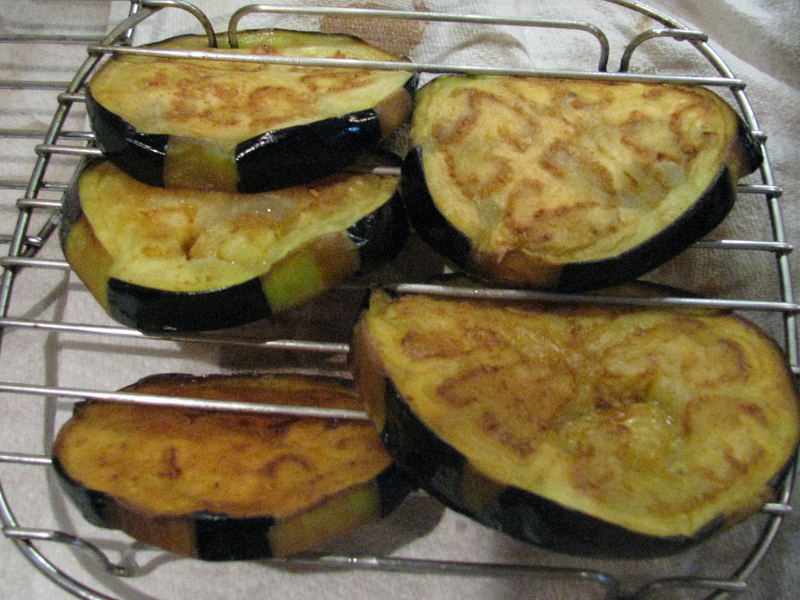 Eggplant is usually sliced and deep-fried. It has a lot of water content and very absorbent. To get rid of some of the water and to seal the meat of the plant against absorbing too much oil, you should salt the slices and let them steep for an hour. The salt draws the water out and makes the eggplant less absorbent. You should then rinse the slices to get rid of the excess salt and pat dry with paper towel. If you don’t do this, your dish will come out too salty. This is a more complicated dish to make and it takes some time, so don’t expect something nice and easy like Spaghetti alla Carbonara. As usual, the recipe is based on the great Marcella Hazan (see The Three Best Cookbooks), although I use a lot more tomato and parmesan cheese than she does. I like to serve this as the main dish accompanied by a green vegetable like broccoli. You don’t need much else. Call you friends the day before and remind them that you are going to make Eggplant Parmesan. Anticipation! Slice the ends off the eggplant, peel them if you wish, and then cut into slices about ½ “ thick. The dish is probably more nutritious with the skin intact, but it is also slightly more bitter and difficult to cut. It is good either way. Salt both sides and stand upright in a colander in the sink. You can also use an oven rack and slip the slices between the rungs. Let them steep for about one hour. Rinse the excess salt off the slices and, using the palms of your hands, press them dry between layers of paper towel. Set aside. 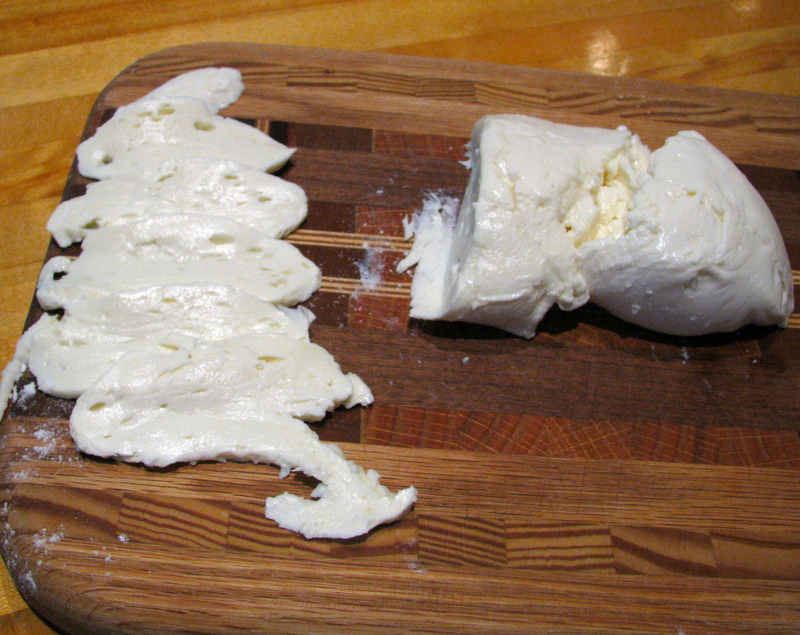 Slice the mozzarella as thinly as possible; wash and tear up the basil leaves; grate the Parmesan cheese. You want everything ready. Grease a rectangular glass dish with butter, making sure to get plenty on the sides. Pour the tomatoes into a colander and rinse well. Coarsely chop and put into a small saucepan with the olive oil and simmer until most of the liquid is gone. While the tomatoes are simmering, choose your largest frying pan and add enough vegetable oil to produce a depth of about 1-1/2 inches. Turn the heat to high. 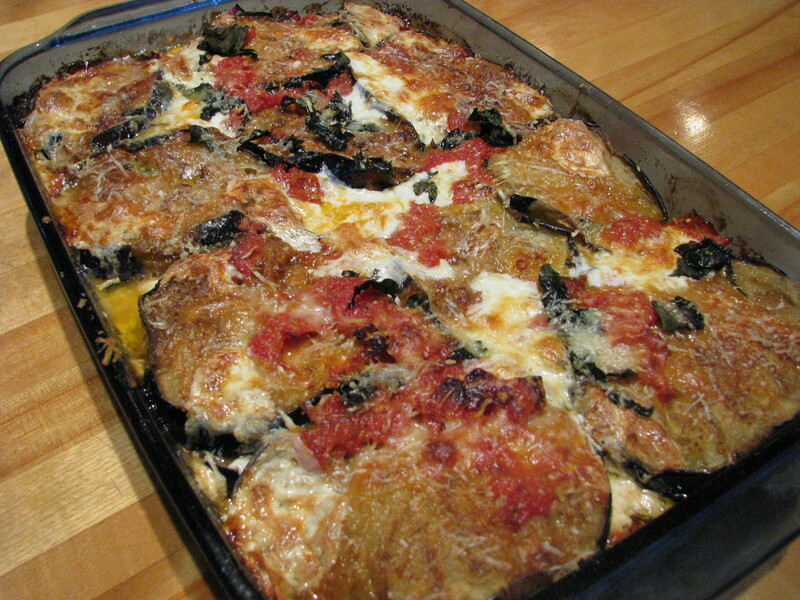 Put the flour in a shallow bowl and lightly flour the eggplant slices. Shake off the excess. 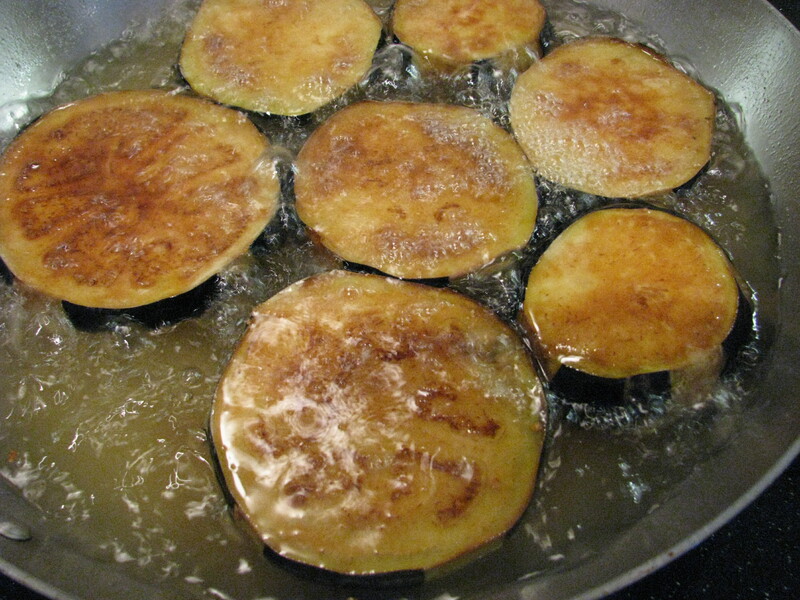 Fry the eggplant in batches about 2-3 minutes on each side. Turn when golden brown. The oil should be hot enough to make the eggplant sizzle. Put an oven rack on the counter over some paper towels. Stand the cooked slices upright by slipping them between the rungs of the rack. You want to drain off any excess oil. Assemble the dish by layers. 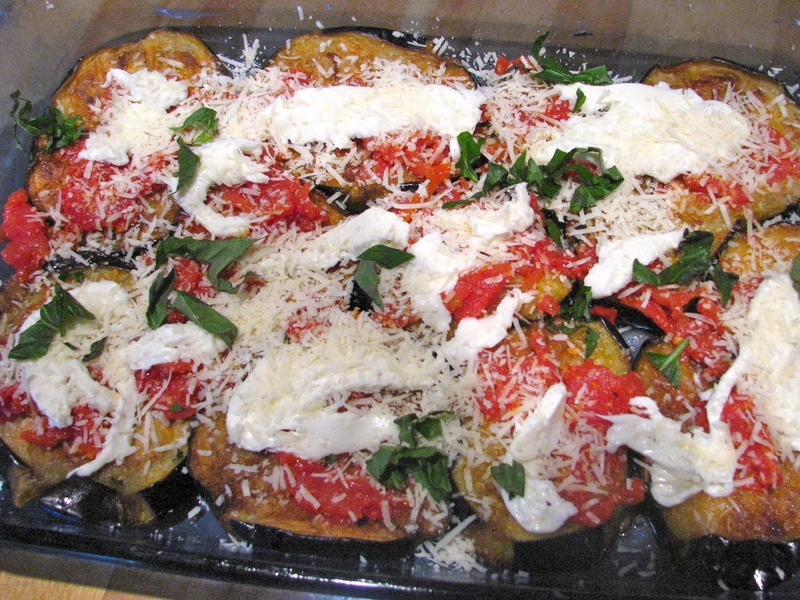 Put a layer of eggplant on the bottom of the dish, add a layer of mozzarella, spread some of the tomato sauce, parmesan and basil leaves. Repeat so you have three layers – you should have just enough eggplant. Put an extra amount of Parmesan on the top. Preheat the oven at 400 degrees. Wait until your guests arrive, show them the dish and slip it into the oven. Bake for 35 minutes while you have cocktails. Carefully pour any excess oil or liquid off and let the dish sit for 15 minutes. Cut into squares and serve. Hey thanks for following my blog. I hope you enjoy trying out some of the recipes and let me know how they turn out. Your blog looks fantastic.